Okay well I have been going a bit heart mad here making hearts, I'm enjoying myself, and that's a good thing. I don't have my lovely Mum anymore, not in body anyway. She is and will always be most sorely missed. The daily phone call of sharing what's happening in our world, and our devoted follower of life's ups and downs. Someone to call and say 'I'm back' after a long journey. Someone to drink tea and eat cake with in favourite cafe's. My listener, supporter and all round ground holder. I would always find a little something heart shaped to give her on her birthday or christmas or for celebrations. I would look out for red hearts, because red was her favourite colour, whether it was chocolate or a glass bauble or a card. I actually think she started the tradition, by giving me a red velvet heart cushion, which I still have today. 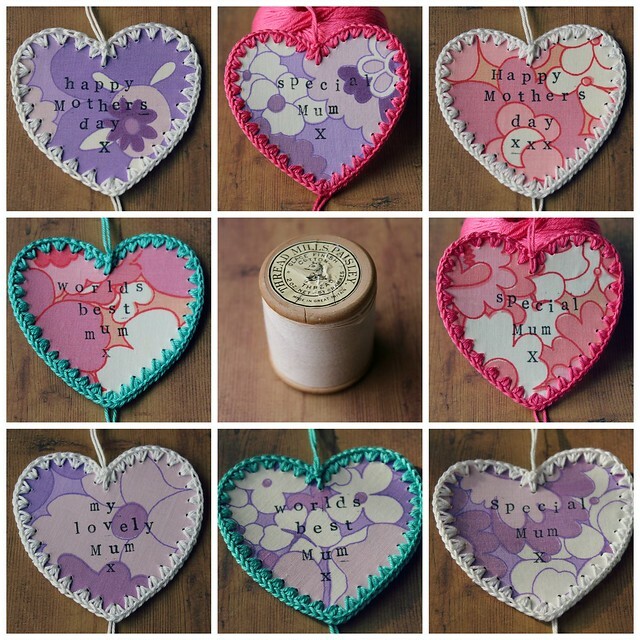 I have made these hearts bigger than before, as they should be of course! Each heart comes attached to a blank white square card, with an envelope for sending. The heart can then be taken off and dangled wherever feels a good place to see it! I can send the cards by first class post, which for the U.K keeps the postage quite low. Because of the depth of the crochet, it doesn't quite fit the guidelines for letter depth for international post, so I would need to send as a small parcel. This costs a bit more. I'm going to think about what else I can do to keep the postage down. Oh yes, in the middle is a lovely chunky cotton reel I brought at the vintage flea market in Ludlow on Sunday. I thought it might make a nice prop! I have to take the teen here now again to meet his Dad. It's the half way point, seems as he has now moved to North Wales. I am gathering photo's, it's a lovely town and I will do a post about it sometime. Have a good week, if you would like a card they are in my sHoP. So sweet! Your mom would have loved them. They are darling! beautiful thoughts about your mum!!!! Lovely words about your Mum. I adore Ludlow, my Grandparents lived there and I stayed many times as a child. My parents live quite nearby.